Alkǎlami (pronounced al-KA-la-mi) is the local word for the Arabic “qalam”, a type of sharpened stick used for writing on wooden boards in the Kano region of Nigeria and in Niger, and what gives the style its distinct appearance. The baseline stroke is very thick and solid. The ascenders and other vertical strokes including the teeth are very narrow when compared to the baseline. A generous line height is necessary to allow for deep swashes and descenders, and the overall look of the page is a very black, solid rectangle. Diacritics are much smaller in scale, with very little distance from the main letters. 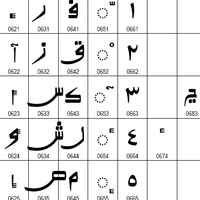 Alkalami is a font for Arabic-based writing systems in the Kano region of Nigeria and in Niger. 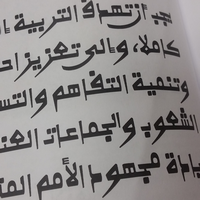 This style of writing African ajami has sometimes been called Sudani Kufi or Rubutun Kano. A type sample showing an inventory of some of the unusual of glyphs and features can be seen here: design type samples. Alkalami also includes a Light typeface. This font uses state-of-the-art OpenType font technology, including variant glyphs for a number of characters for use in particular contexts. It also prevents in-word collisions by switching out default glyphs for alternates. Read more about our smart font features. 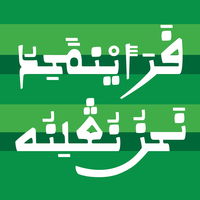 The Alkalami font supports the characters known to be used by languages written with the Kano style of Arabic script, but may not have the characters needed for other languages. Read more about our character set support. Alkalami is the first attempt at a typeface design based on handwritten manuscripts from Nigeria, in a style of writing called Rubutun Kano. This font is designed to work with the OpenType advanced font technology. To take advantage of the advanced typographic capabilities of this font, you must be using applications that provide an adequate level of support for OpenType. These advanced capabilities provide access to the variant character forms used in some languages, as well as a 'smart' font that switches out letters to avoid collisions as you type. See complete Alkalami - FAQ list.